Grilled Portobello Mushrooms are easy to make and a great addition to any wrap, salad, sandwich, or grain dish. 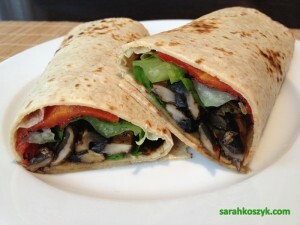 Enjoy a warm wrap for a cold winter lunch with this fast grilled Portobello mushroom wrap recipe. Adding in the marinated roasted red peppers gives extra flavor and color. The wraps can also be an easy-to-eat, finger-food appetizer at a party by just cutting the wraps into slices for people to munch on during the sports events. Place mushrooms, vinegar, garlic, oregano, and basil into a bag and marinate in fridge for 2-3 hours or overnight. Turn on grilling appliance (George Foreman or Panini maker). Remove liquid from mushrooms and grill mushrooms for about 6 minutes or until semi-soft. Heat medium sized pan to medium-high heat, and warm tortillas about 25 seconds on each side. Place pepper, mushroom, and lettuce in wrap and enjoy.